“It was our fault Amy was dead. All of our faults. The best friend who had bailed; the boyfriend who had been running late; the guy who hadn’t answered his phone. 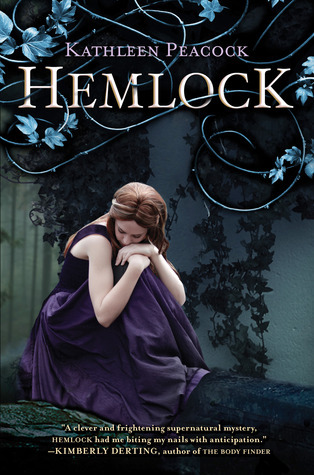 the little town of Hemlock is changing, and fear is spreading. In this town full of murder, lies, secrets and werewolves, Mackenzie really has her hands full. Still riding off the grief of losing her best friend, Mac leans on her other friends Jason and Kyle to help clear up and try to solve Amy’s gruesome death before the town caves in to the terrorization of The Trackers– extremist werewolf hunters. Does Mac really know what she’s dealing with? “He had accused me of not caring. If he only knew what thoughts were running through my head. I have to admit that this book started off lackluster for me, and I was about to stop reading it after the first few chapters. Yes, it told us of Amy’s death, but for those few chapters the plot just sort of floated in the air and didn’t go anywhere. I was relieved, as I decided to continue reading, that the story got infinitely better. Like a good book, it held my interest, kept me in suspense and provided a great mystery. Although I had figured out the main culprit of the crime fairly early on, with the author’s great descriptions of everyone (and the clues surrounding the death,) I was elated with the additional secrets and shrouded mystery around it. This is probably my first official werewolf book, so take this with a grain of salt, but I felt that this storyline was quite original and thus very engaging. Character-wise I found everybody, with their secrets and obscurity, interesting. I really loved Mac’s character, but it was frustrating to see her in so many dire situations. This is good frustration, not annoyed frustration, as the constant tension adds to the book. This is a young adult book, so there is a love-triangle... or maybe a love-square. It isn’t overtly pushed, but it’s presence does have a great bearing on the plot. A huge bearing. Love that isn’t reciprocated helps tone down anything being too “lovey-dovey,” which is why I feel that the love-triangle/square is properly executed. In all, I found the book provided a wonderful paranormal mystery. As a young adult book, it is a good read that will have people staying up to the early hours of the morning, reading in suspense. I’m not all too sure how the next book can compare to this, based on the ending, but I somehow feel that it should have just been a stand-alone book.